I’ll start this one at the end. 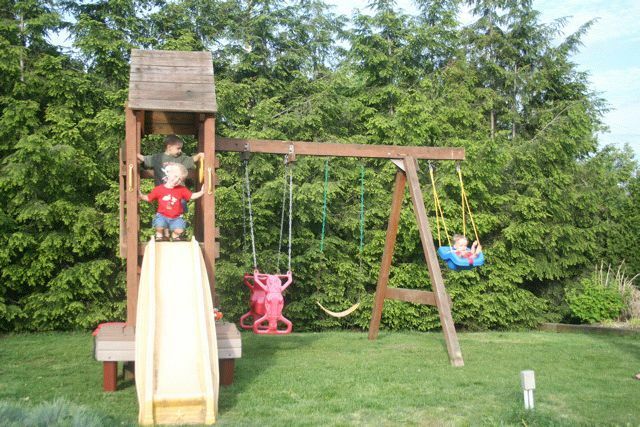 We have a new/used wooden play set for the kids in our yard! Complete with clubhouse/fort, climbing wall, swings and all. Craigslist is wonderful and really has helped us get the things we want & need lately, while helping the budget. Getting to this point was a little challenging. Mike and I didn’t quite see eye-to-eye on the need for the play set. Granted, when we first moved into our house, which is smack dab in the middle of a community park, with playground across the street, I was in agreement that having a swing set in our yard was not necessary. All the luxuries of the park are at our disposal and not at our expense (well, not our immediate expense… but paid for with tax dollars!). However, as the past few years have gone by and E is growing up, gaining some independence and enjoying being outside, my point of view has changed. Because he is such an active little boy, who has a huge imagination, I thought it was time to give him his own play set, with a fort/clubhouse to let him expand his imaginative mind and have some backyard adventures. And given the fact that he wants to be on the go and playing all the time, more than he’d like to eat or sleep… , it only makes sense to me to have this accessible to him in our very own yard. How nice it will be to be able to enjoy our own home, or the pool during the summer, or to even catch something on TV without interruption, all because E will be able to go outside and play without constant supervision. And soon enough, F will be right behind him out there in the clubhouse. Mike, on the other hand, sees no need for this giant “lawn obstacle”. Not only will this make it more awkward for cutting grass, and may even kill the grass in some places (gasp! ), it’s a waste of money and generally not a good idea. Well, my dear…. We aren’t raising grass, we are raising kids. We waste our money on much more senseless things. He’s not old enough, nor big enough to be crossing our busy street on his own. And, just wait until the Steelers home opener is on TV and you want to kick back in the recliner and watch it… rather than having to listen to it on your iPod while standing at the park pushing a swing, with a cranky baby who needs a nap in tow… E can head outside himself, with a little bit of independence in his back pocket, to play and F can be napping in his crib. As you see, I won this time (Well, most times, let’s be honest). But really, as summer kicks in, he’ll be thanking me. We created a little play land for the kids, now we can start on the backyard sanctuary for grown-ups. It’s time to pour a glass of wine and sit by the fire, poolside. Ah, happiness. Look the kids are having fun and hopefully you guys can sit back there and just relax, drink some spirits of sorts and watch them instead of chasing them all over the hill. You know I had some slightly sore muscles from pulling/pushing Eion on that swing for those few hours.